Man AND Womans Best, and most cooperative (if treated right), Friend. This Category is VERY entertaining to me..and I hope it is to YOU also. There are the old style Dog Costumes, the ones where we recognise that these beasts have 4, not 2, legs that they walk on. Now you'll see costumes that, I SWEAR, makes a Dog look like a very short human is walking right toward you. Well... Instead of trying to make sense out of what I just typed here... let's just take a look. You'll soon understand what I mean. 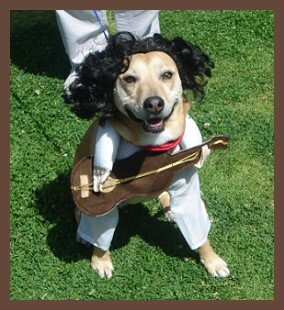 Above are homemade costumes for dogs entered our Halloween costume contest. 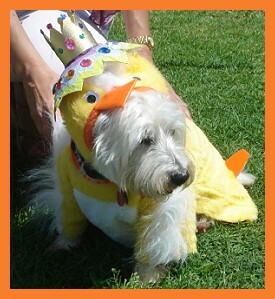 Send us photos of your beautiful dogs wearing costumes and you will be automatically entered to our contest next year! 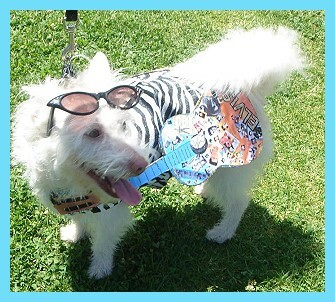 Whether you go with the older style Dog Costume or the newer one... the point is to HAVE FUN! I got VERY lucky just a few days ago and I MUST say THANX to Jackie for making my day! (or week? or month?). Jackie sent me PICTURES she took at the Easter Parade in her area. 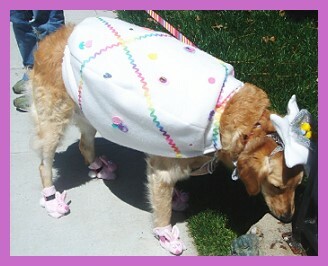 ...and... You GUESSED it: DOGS were dressed for the Occasion! 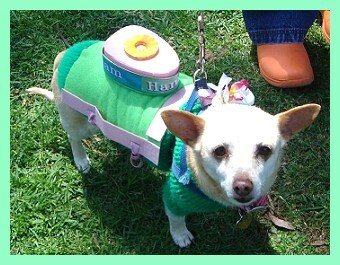 Now I will share the photos of pet costumes with you here. I thought to put them on the "Easter Costumes" Page but considering that Easter is OVER now ...I just don't think many people will be visiting that page until next year and these are just TOO CUTE to hide away like that so HERE WE GO! 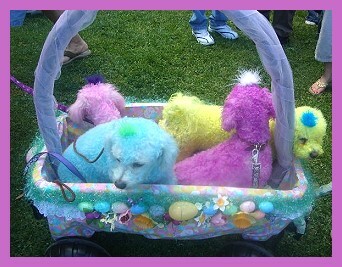 I have done some research, and have found that EASTER is, in fact, one (mayhap the ONLY one) of the "occasions" for dressing-up dogs in costumes... Like parades or contests at a local park. Be sure to check it out in your area. one of those 2 legged puppy costume? Sent to me in Sept. of '07 by Julia's owner Traci. Kids LOVE this stuff too so get THEM involved! In Fact, Your Dog may even be able to wear some of your sons shirts from when he was 5! Saying this, it's a lot of fun creating a Dog Costumes at home out of old clothing and such. As a matter of fact, some time ago I was asked WHERE a person might find a "Confederate Soldier" costume for a middle sized dog. 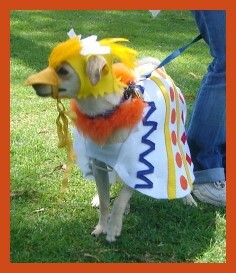 Searching all of the stores and wherehouses that I have access to I could NOT find this particular costume for a pet. The best idea I could come up with was to purchase a inexpensive Confederate Soldier" Costume for either an adult or child (depending upon the size of the dog) and then do whatever adjustments would be necessary to fit the Jacket, and possibly the cap, to the dog. It would, of course, be helpful if somebody in your family were helpful as a seamstress, However, using ones imagination and some scissors, velcro or glue... you may just surprise yourself at just what a great Confederate Dog Soldier you come up with. (The obvious thing when making costumes for dogs, aside from "comfort" of fit of course, is to leave the rear-end and underside free of obstruction to consider unscheduled potty breaks.) 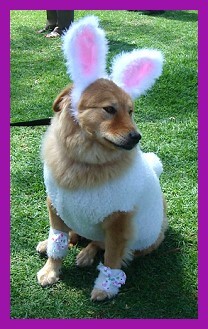 Check out the OnLine stores for Sewing Materials or Crafting Materials to assist you in a homemade dog costume project. 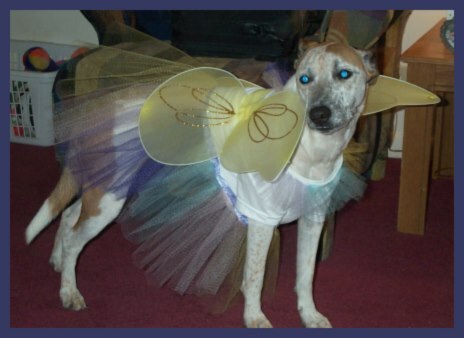 If you simply don't have the time nor inclination to Hand-make a costume for Hilde or Bailey (your Dog)... do it the easy and trouble free way and shop Online through one of the links in the Costume Shops section of this website.